Have you ever heard of candy made from a potato? For years my mom has talked of this mysterious potato candy that she loved as a little girl. She would spend magical summers at her grandparents house gleefully running through grapevine arbors, relishing in the homemade jams and jellies made from the grapes. Hours would melt away watching and helping her grandmother work her magic in the kitchen. Whenever homemade mashed potatoes were served with dinner my mom knew that delicious potato candy wouldn’t be far behind. My mom and I have been planning to make this sweet treat for, well, more times than I care to count. Somehow life always seems to get in the way and we never seem to get it done. While at the cabin last weekend, the earth, sun and stars of potato-making-candy aligned and a rich, decadent fudge-like candy was the result. Oh. My. Heavens. Was it good. It all began while antiquing. It’s an antique potato masher. I must say that I enjoyed the daylights out of that sweet little potato masher. It made homemade mashed potato making all the merrier. The next day we set to work to recreate the simple yet delicious candy. Leftover homemade mashed potatoes, powdered sugar, vanilla, salt and peanut butter is all you need. Homemade mashed potatoes are key. 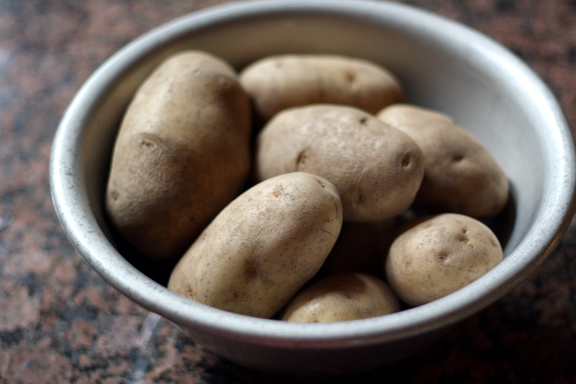 They are thicker, heartier and act as a better binder than the boxed mashed potatoes. Put homemade mashed potatoes, vanilla, and salt into a bowl and add one cup of powdered sugar at a time, while kneading with your hands, until mixture becomes a firm fudge-like consistency. We played around with the ratios and found that 1/2 cup of mashed potatoes mixed with 5 cups powdered sugar made the perfect batch. Evidently depending on the way in which the mashed potatoes are made, can effect how much powdered sugar you may need. So feel free to use a little less or more than my recipe suggests. 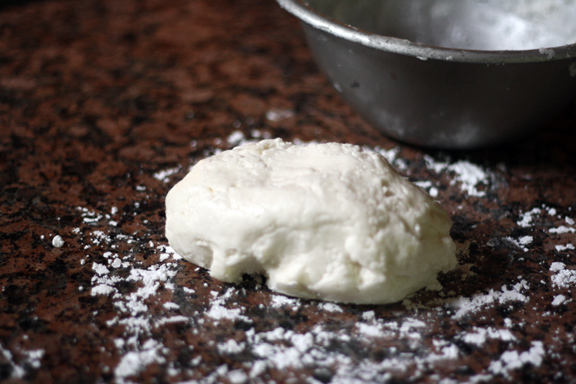 Just make sure that the mixture is firm enough to hold its shape and not so dry that it crumbles. Does that make sense? I recommend dividing the mixture in half. I found that it was much easier to work with a smaller amount when rolling and cutting the candy. 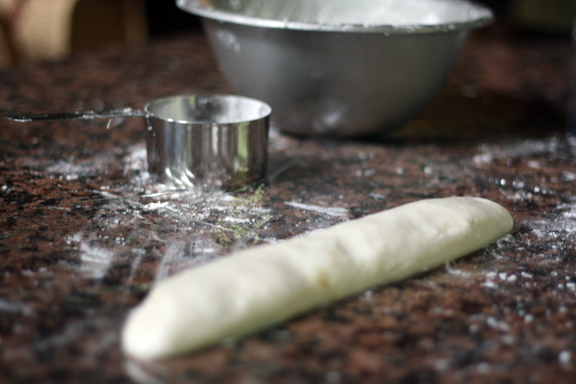 Sprinkle powdered sugar on your work surface and rolling pin then roll into a 1/4 inch thickness. 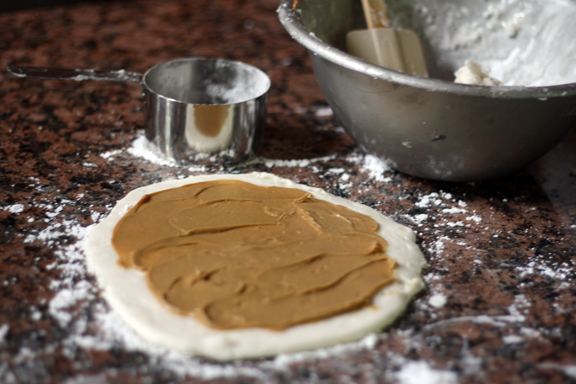 Spread a thin, but not too thin, layer of peanut butter on top, about 1/4 inch. If you use too much it will squish out the sides when rolling it up. Then carefully roll into a loaf and cover with plastic wrap or wax paper and chill for at least 1-2 hours before cutting into 1/2 inch slices. That’s it! Let me just tell you that I had no idea how divine this potato candy would actually be. It tasted like peanut butter fudge. 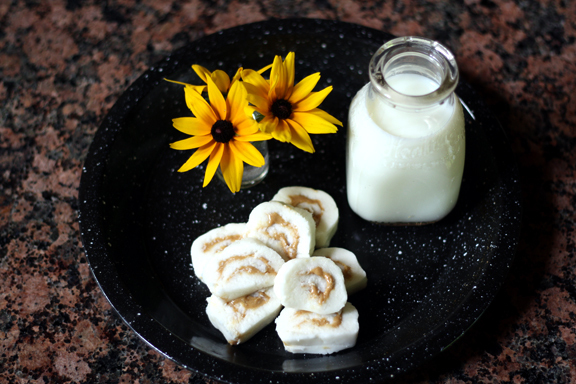 I can’t wait to experiment with some other favorite combinations, like chocolate, or Nutella! Mmmmmmmmmmmm. Seriously, the possibilities are endless! Now go ahead, impress your friends & family with some good old fashioned love today! Wait till you see the look on their face when you tell them that it’s made with mashed potatoes! Put mashed potatoes, vanilla, and salt into a bowl and add one cup of powdered sugar at a time, while kneading with your hands until mixture becomes a firm fudge-like consistency. You may need a tad more or less of the powdered sugar depending on how the mashed potatoes where made. Make adjustments depending on the texture of the mix, you’ll want it to be firm & dry enough to keep its shape but not too dry that would cause it to crumble. Divide the mixture in half, sprinkle work surface & rolling pin with powdered sugar and roll the potato candy into a 1/4 inch thickness. Spread a thin, but not too thin, layer of peanut butter on top, about 1/4 inch. If you use too much it will squish out the sides when rolling it up. Gently roll into a loaf and cover with plastic wrap or wax paper and chill for at least 1-2 hours hours before cutting into 1/2 inch thick slices (approximately 12 per loaf). oh my word! This is the craziest thing I have ever heard of! I have always wanted to try this as well!! Looks PERFECT, wendy!! Oh wow. I have never, ever heard of this and I love that you made it with your mama. And that antique masher is amazing. I want to go antiquing with you! WE LOVE ANTIQUING!!! Would go with you anytime. What a find! Love the cabin, love the blog and love you!! I’ve never heard of such a thing, but my life has just been taken in a new, most beautiful direction. I have never heard of such a thing as potato candy! I would love to try it. And I would especially love to make it, if I only had a potato masher like that. It’s beautiful. Back home (on the east coast of Canada) we make the same thing but without the peanut butter. We would roll the potato mixture into little balls and dip them in chocolate. You would swear it was store bought candy….delish! I have never eaten or made potato candy, but it looks tasty. I bet Nutella would be good too, as I am in love with the stuff. I have never heard of this before but I must give it a go next time we have mashed potatoes, you have made it sound too delicious!!! I vaguely remember this. Looks like fun too! A whole new world of sweet! Definitely adding these to the ‘to try’ list. Thanks Wendy! This totally brought back memories of baking with my Grandma (who passed away just last December). Her version of potato candy was actually in the form of snowballs but the base is the same (you just make little balls out of it, dip it in chocolate, then roll in coconut). So great to have these recipes passed down. Thanks for sharing. I think this would be awesome with Nutella as well! Interesting! Definitely never tried it before and looks fun to make! love antiquing almost as much as i love this recipe – i mean, seriously . . . mashed potatoes and peanut butter . . . how bad could that be?!! Wow! This is my kind of sweet potato! Wow…this looks so wonderful! I must try immediately. Thank you so much for sharing!! Ooh… sounds like fun. Marking so I can do try this when we’re back in our house! Intriguing! I also have never heard of potato candy! But with powdered sugar and peanut butter, I know it is irresistible. I very much enjoyed reading about you and your mom cooking together. Recipes that evoke a sense of time and place are delightful. I adore antiquing. The cabin is beautiful (I love the history behind it! ), and this candy? I’ve never heard of potato candy, but once I have a bit of this, I know one thing- I’ll be making mashed potatoes far more than usual. Wonderful post! So good to see this recipe! I am 68 years old and my Mother made this candy for us when we were growing up. 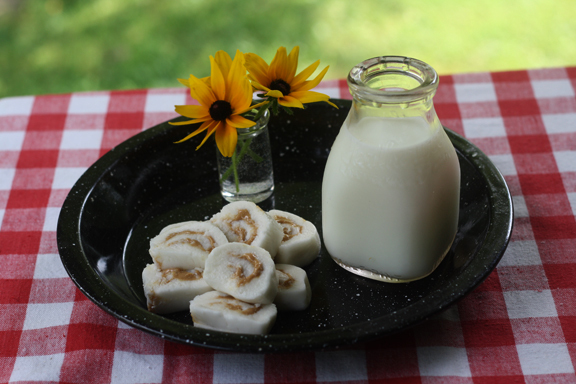 Love, love , love potato candy and such sweet childhood memories of enjoying this old family favorite. I tell people about this and how good it is, and so many people never heard of it. They sure missed out on a good thing. And you are right NEVER use anything but the real mashed potatoes. This looks amazing! I’ve heard of potato candy, but I never knew what it was. I think it looks pretty incredible. I definitely need to give this a try! Thank you….thank you! I have been searching for this recipe and you can be sure that I will be making this as soon as the weekend get here! Loved this as a kid!! I have never heard of this but now I must try–fascinating! 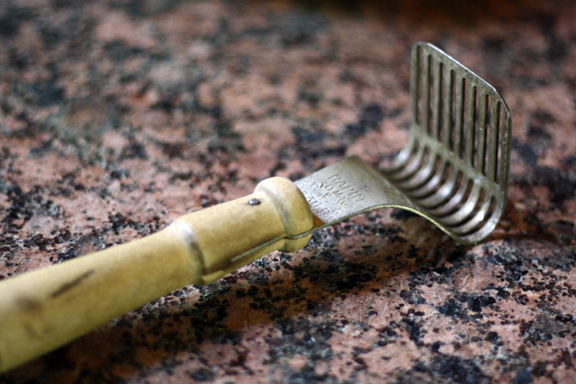 Oh my, I love that old potato masher! What a great prop. I’ve always wondered what potato candy is and now I can’t wait to make it! Beautiful masher and pictures as well. You had me at candy. And then at potatoes. And then at peanut butter. I love family recipes and traditions like this! Oh, my goodness. I haven’t had potato candy since I was a little girl! You know what this means, right? Yep, making potato candy this weekend. I have never heard of potato candy, but anything that tastes like peanut butter fudge is amazing in my book. Few things pop up in my perusal of blogs that I can’t identify with in some way but I’m with others…have never even heard of potato candy…and of course now I’m dying to try it. Much like the potato chip cookies I make…sounds a bit weird but OH SO GOOD too huh? My MIL would die if I made this. You seriously are gonna get me brownie points with this recipe! I remember someone back in the day talking about these but I’ve never made them, looks fab! I made this for the very first time last month, and didn’t even know it existed before that! A perfect way to use leftover mashed potatoes!! I never know what to do with leftover mashed potatoes… we always have them. Now I know exactly what to do next time! This is the best. I grew up with my Mom making this when I had friends over for slumber parties. I’m SO going to try this. Nutella maybe? With peanut butter! Ohhhhh the possibilities! I am LOVING this….now if I could just control myself so I actually have left overs next time I make mashed potatoes. New follower. Found you on stumble. Glad I did. So fun! I love when vintage charm meets up with yumminess. 😉 Thanks for passing this recipe on. I can’t tell you how delighted I am to have found my way here from The Pioneer Woman. Not only do I love your photographs and your list making me station, but FINALLY potato candy. Years and years and years ago I was at a friend’s house. Her mom asked us to stop what we were doing, which was mostly talking and daydreaming about boys, and come help her. We made potato candy that day. And, in all the years since, I’ve never come across it again or tasted anything better. Of course, I probably could have used the internet to track it down long ago, but the little joys that find their way to you are so much better. Don’t you think? We make little mints with this same mix. Add a few drops of mint extract, a touch of food coloring, and let the kids make little balls (olive size is good,) then flatten them. Our daughter sometimes dips them in chocolate. Good, and a fun project for the kids. Stumbleupon brought me to this. I lived in Appalachia during high school and my next door neighbors made this all the time. Being from Connecticut, where we think we know everything, I was dubious. But it was delicious! I went back with my own family a few years ago and my kids discovered it and my daughter’s been trying to come up with a recipe ever since. I’ll show her yours. Thanks! Since when do people not make their own mash? These sound delicious and look just adorable. Thank you so much for posting directions…I will have to give them a try! Lightbulb moment for me…I’ve eaten these before and I’ve heard of potato candy, but I never realized they were the same thing! YUM! I am certainly going to make some homemade mashed potatoes tomorrow to go with meatloaf. Have to make extra potatoes just to be sure to have leftovers. Going to make the peanut butter ones, but am also trying some of the alternatives that folks posted in the comments. Thanks so very much for sharing. this is a scottish recipe and its called “macaroon”. The previous description of it being dipped in chocolate and covered with coconut is how it is sold in the shops. I had never thought of putting a filling in and rolling it like this however, its definately something i am going to try. i think the peanut butter will cut through the sweetness amazingly! Another way to cut through the sweetness is to substitute cocoa powder for part of the powdered sugar, the amount depends upon how chocolaty you want the candy. Tastes great. Potato candy is so good. I have not had it for years. My grandmother made it for me when I was a little girl. Thank you for this recipe. I am going to go and make it for my daughters now! Hi! I found your blog via pinterest and am a new follower. I am loving the posts I’ve seen so far! I had some recently with Nutella filling instead of peanut butter – awesome! You say to use leftover mashed potatoes… does it matter that they have all the other savory ingredients that go into regular potatoes (i.e. butter, salt, pepper, herbs, etc.)? If making the mashed potatoes specifically for this recipe is it best to just keep the ingredients as minimal as possible, say just cream and butter? I used all of the regular ingredients, butter, milk/cream, salt but not too much pepper. Hope you enjoy the potato candy as much as we do! Not only does this sound delicious, it looks great. The photos are beautiful. I made this with my boys a few ago…yummo!!!! I’ve never had potato candy before but read and remembered the recipe from a cookbook I read some 40 years ago. I think I will finally try it soon! Trying this out for my job’s iron chef contest. the secret ingredient is potatoes….I hope I win! I have been looking for a mashed potato candy recipe for YEARS! My Mom used to make this every Christmas and just the thought of it would make my mouth water. I have recently been in therapy due to some heavy issues from childhood and my therapist suggested I try to find and recreate one of my Mom’s recipes. I can’t wait to try this! Thank you! Also, good find on the antique potato masher! My grandma used to have several of those for the grandkids to use to get the potatoes mashed sooner! My mom makes this every year for mine and my grandfather’s birthday, which happens to fall on the same day. It has always been one of my favorite desserts and is always an option at Christmas! My mother has made this potato candy ever since I can remember….always yummy & sweet!!! I just stumbled upon your site and I just had to check it out. I’m glad I did. I’m a little ashamed to admit to have never heard of potato candy! The recipe looks simple enough and judging by other comments it’s a must try 🙂 Thanks so much for the recipe and I’ll return and let you know what the family thought. Candy is candy right? Just found this, yours seems to be the most complete of what I remember. My mom used to make this for me when I was a kid, and she even made some and sent it to me when I was deployed in Desert Storm/Desert Shield. Truly made being there better for one day! Didn’t last long! She died a few years ago, and this is one thing I never asked her about, but wanted to know. So thanks for posting it, Happy Holidays to you, and have a great day! My grandmother made this candy every year at Christmas. We lost the recipe and was so glad to find it . This brought back many wonderful memories of past Christmases many many years ago. In my experience, the first sugar addition ALWAYS turns it to soup. One normal russet potato uses almost a 2lb bag of sugar. 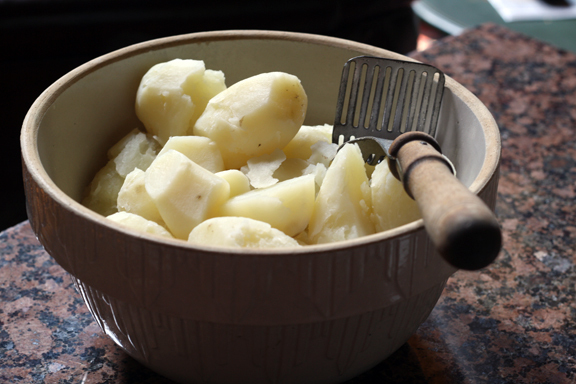 Salt isn’t necessary but just a dash takes the flatness out of the potato. Hi, I’m thinking of making these for the elderly folks in our church for Christmas -around 40 people (Yes, I’m crazy…) Do you have a suggestion as to how to package them so they don’t go stale? I’m wondering how long they actually last with the powdered sugar ingredient…and how many pieces would be a good gift amount? My Mom used to make this for us 5 girls. I finally found the recipe on line and made it for Christmas this year. Be careful not to let it get too dry tho. Maybe because we had so much sweets but hardly no one ate it. No prob. More for me! This looks extremely delicious but does it takes like mashed potatoes or does the after taste have a lingering taste of potato? There is absolutely no *mashed potato* taste at all! It’s just sweet & peanut buttery!! So delicious! I found the exact same type of antique potato masher at a consignment store today and found your blog when I googled “old-fashioned potato masher”. Very interesting Mashed Potato Candy recipe and also the Hard Tack candy recipe. You have a fun blog and a funny wit. Aloha from Maui!